How a full-time businesswoman went from producing one painting a year to hosting her first solo exhibition of 60-odd works. Having spent most of my life in the Caribbean, the idea of painting a coconut tree bores me. It has become a staple feature in Caribbean art. It is overdone. So if I actually find myself enjoying a Caribbean art exhibition, there must be something more than the stereotypical tropical scenery. 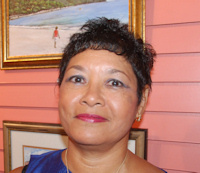 Trinidadian painter Marise Rodriguez is quickly establishing her name with her Caribbean-themed work. After viewing the 58 pieces on display at her first solo exhibition, ‘Marise Retrospection in Art’, the thing that strikes you the most is her technique. 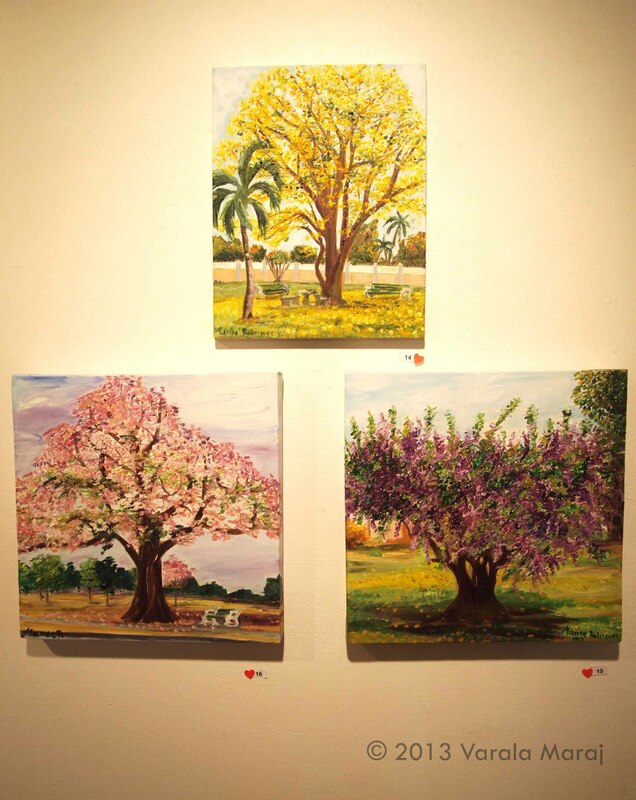 The self-taught artist conveys her love for her homeland, Trinidad and Tobago in every piece. 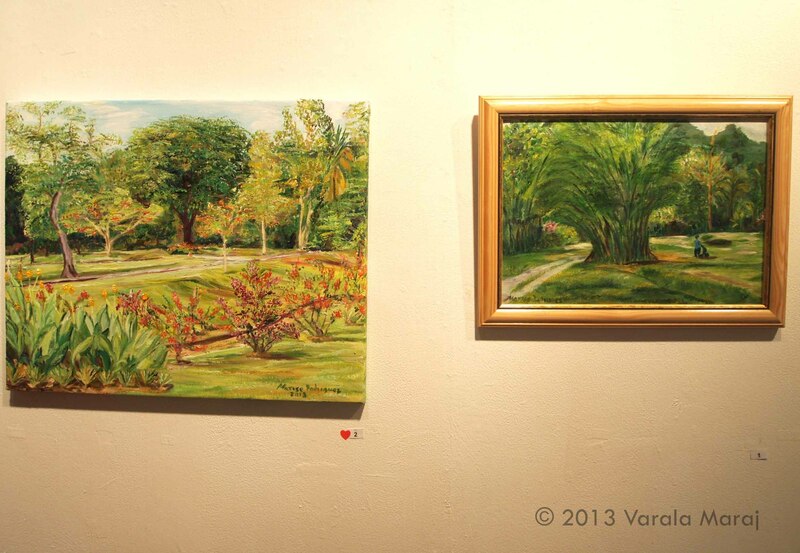 With paintings ‘Golf Course – Chaguaramas’ and ‘Botanic Gardens’ at the start, Rodriguez brings the outdoors into the Art Society of Trinidad and Tobago. With diligent use of oil on canvas, Rodriguez produces rich golden tones and bright greens that pop off the canvas. And this is no exaggeration. Her impressionistic style adds dimension to her work. It creates a texture that dares to be touched. Her style, which she describes as “impasto” is nothing short of professional. It is hard to believe that just a few years ago, she was limited to only turning around a single piece every 12 months. Still clutching her glass of white wine, she continues: “I only had time to paint once a year. One painting a year! So since I retired, I got a little more time. My daughter encouraged me to join Women In Art. I joined that. 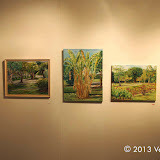 I entered the exhibition, sold a painting. Entered the following year, sold two paintings. That sort of really got me excited. I didn’t believe that people would appreciate my art”. And just like Monet, Rodriguez captures her love for nature with en plein air landscape paintings and translates this via impressionism. But Rodriguez does this in her own way. Her brushwork is versatile. Strokes are precise; dainty at times. But others are generously doused. In ‘Pink Poui #1 Savannah’ she layers light pink, dusty rose and deep violet shades. The small dabs of paint dazzle as they take the form of a poui tree. 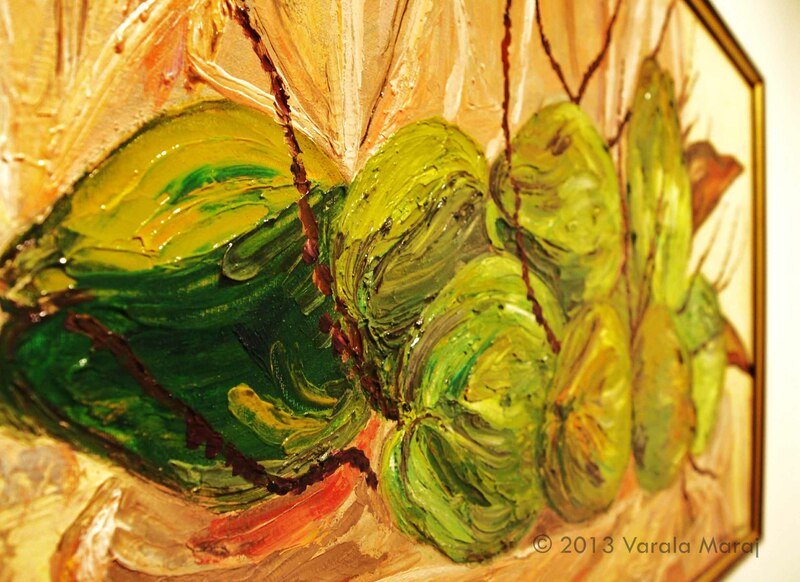 Meanwhile ‘Lovely Bunch of Coconuts’ features thicker, more elaborate impasto styles which blend evergreens, olives and yellow greens that glisten in the dim lighting. Using softer motions, Marise captures sea blues and coastline inspired khakis in works such as ‘Sandy Point Jetty Hut’ and ‘Mt. Irvine Bay Swimmers’. Then she conveys a panoramic view using a 30” x 15” canvas to display pale blue waves that crash into stark whites that contrast dramatically against the warm sunset above. Marise admits that ‘Flamingos at the Zoo’ is her favourite from the collection. But by far, her most individualistic piece has to be ‘Flamboyant Root’. With an exceptional eye for bold colour combinations, Rodriguez compels you toward this spectacle. 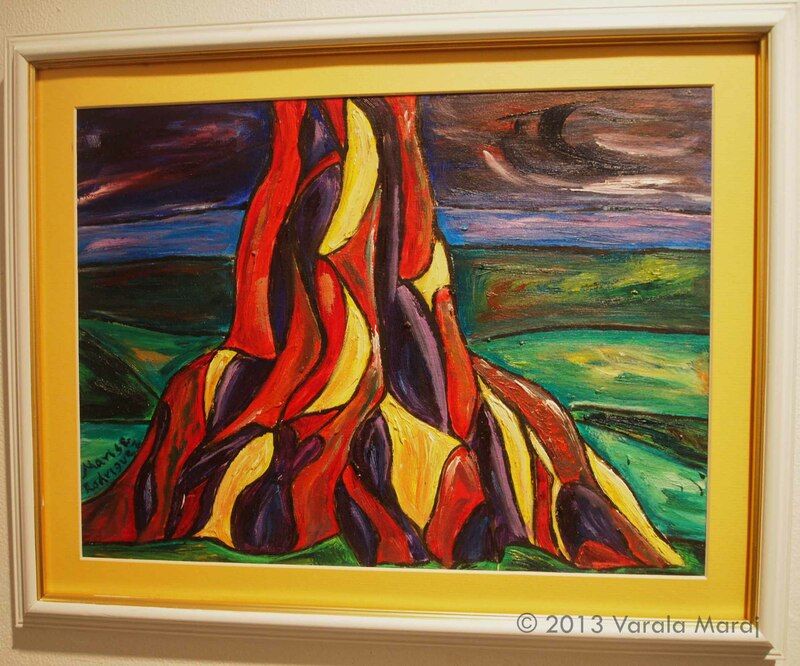 Switching things up, the painter takes an abstract approach to portray a plant’s root, sectioned off into reds, purples and yellows, divided by thick black lines that are also used to differentiate the sky from the grass in the background. The sky is powerful. Dark indigoes fuse with rich eggplant tones that mix with blackened reds to set the sky for the evening while soft yellows accent the range of turquoise, green and teal grass around the volcanic-shaped root. 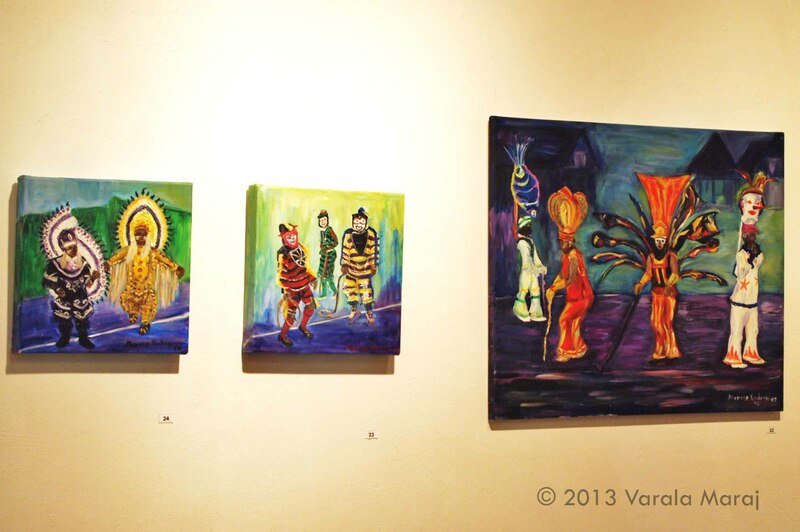 By incorporating pieces with traditional carnival masqueraders, historical landmarks and popular tourist attractions, Rodriguez creates an artistic guide to this Caribbean nation. 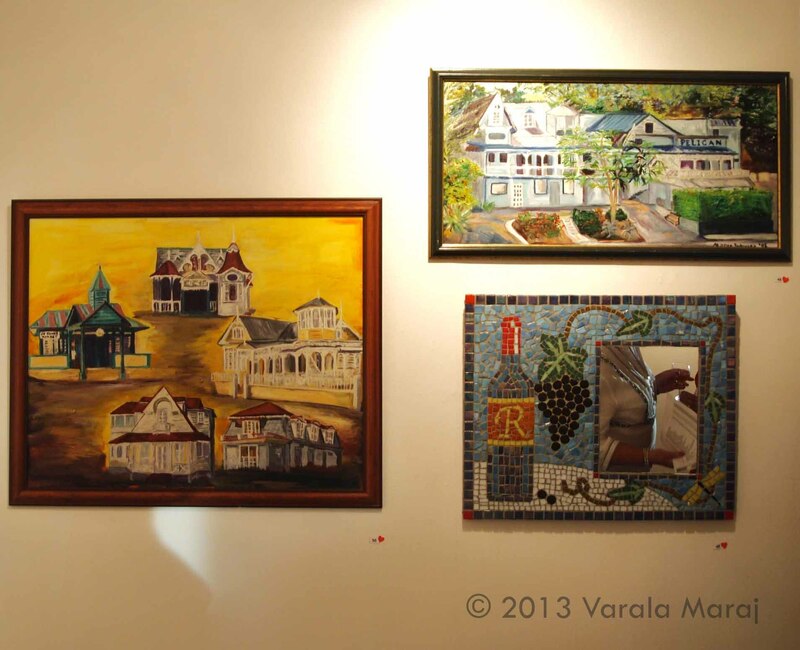 At the end of the exhibition, you are left with walls worth of Trinidad and Tobago sights, sceneries and festivities. And where does this artist wish to visit? “I would love to go to France. Not necessarily Paris, more the countryside.. see all those lovely fields, the little quaint houses… I’ve been to France and I’ve seen all the lovely museums and I’ve seen Versailles but somehow I love the country”. While most of her paintings are sold, some are still available for purchase in addition to prints and postcards online. Part proceeds of sales will go to Trinidad’s Living Water Hospice, for their 30th anniversary. So here’s to buying great art for a worthy cause!